Hi Rob from Sleepmonsters just published my race report from 1000 miles..enjoy! For some time I’ve been aimlessly wandering around Great Britain. I couldn’t find any interesting MTB race covering any important distance, and when I am talking about distance, I mean at least 500 miles. Shortly before Christmas, a friend of mine gave me a call, telling me that exactly such race is organized in the Czech Republic. A race with very interesting parameters: 1,000 miles distance, approximately 131,000 ft of climbing. It didn’t take long and instead of toasting to New Year’s Eve I was waiting for the race registration to be opened. Only 100 racers could register for the race, which included several registrations reserved by the organizer for foreign and other VIP racers. I successfully registered, which meant that I had 6 months left until the race started. The start took place at the end of June. There was no time limit set, everyone pushed as far as his or her body and head allowed them to, and a handful of those luckiest managed to reach the finish line in Nova Sedlica, a small village on the Slovakian-Ukrainian border. The race started near a small town in Western Bohemia. The entire route follows the northern mountainous border of the Czech Republic and then smoothly passes through the midst of Slovakia until its easternmost point. The route changes every year, in odd years it heads from Slovakia to the Czech Republic, and vice versa in even years. Therefore this year, it happened that I went on this lengthy journey from west to east. In the end, I started the race with other 116 adventurers. The race can be pretty much affected by weather, which showed us its treacherous face on the very first day. The first two days were rainy from dawn till dusk. After the period of rain, the weather changed to rather hot with temperatures of up to 33 degrees Celsius during the passage of Orlicke hory (“Eagle Mountains”). The hot weather made the conditions even harder, because we ran out of water supplies pretty fast. Luckily there were many good people around who happily shared their water supplies with me or gave me a heads up on where to get it or where a nearby spring well was located. Remember, the organizer does not provide any resources during the race; each participant has to deal with the given situation and solve it on his or her own. I tried to “sweeten” this discomfort by setting small, partial goals, so that I could be happy about reaching a particular place I determined for myself and to treat myself there with a small snack or a short rest, for example. Although the Czech Republic sits in the middle of Central Europe, the Czech mountains are still very sparsely populated and the route is designed so uniquely that it avoids even this sparse population as much as possible. In England, we always have some obstacles on the tracks, be it gates for sheep or permanent bypassing private or other lands. This is not the case in the Czech Republic. The passage through the landscape is smooth, but extremely difficult. That’s why the race can rightfully take pride in being labelled as “the most difficult MTB race in Europe”. I had to carry all my stuff with me all the time, it is not possible to arrange some meeting point with a friend or to have a support group travelling with me. I was equipped with an ultralight sleeping bag and a bivouac bag with a small 30x40 cm sleeping mat, a compulsory kit, a basic tool kit for bike repair, some cash, and a small backpack with Camelback and room for some basic food, nothing else, every gram counts. Everything is dealt with here and now, which completely changes one’s perception of the world. For several days, you can enjoy a total timeout and escape from the civilized world. You count on random people passing by for help, or people kind enough not to let you die from thirst or hunger. The mountains themselves are an awesome source of energy. Every mountain range is totally different from the other. From long, flattish passages to hair-rising descents in rocky, dangerous terrains. There are also two rivers to ford in Slovakia. The compulsory kit also includes a pepper spray to use in case of an unwelcomed encounter with a bear; the population of which is quite abundant in Slovakia. In order to get to the finish line and be recognized as a true “Miler”, I had to go through 3 check points (CPs) located approximately 400 km from each other. 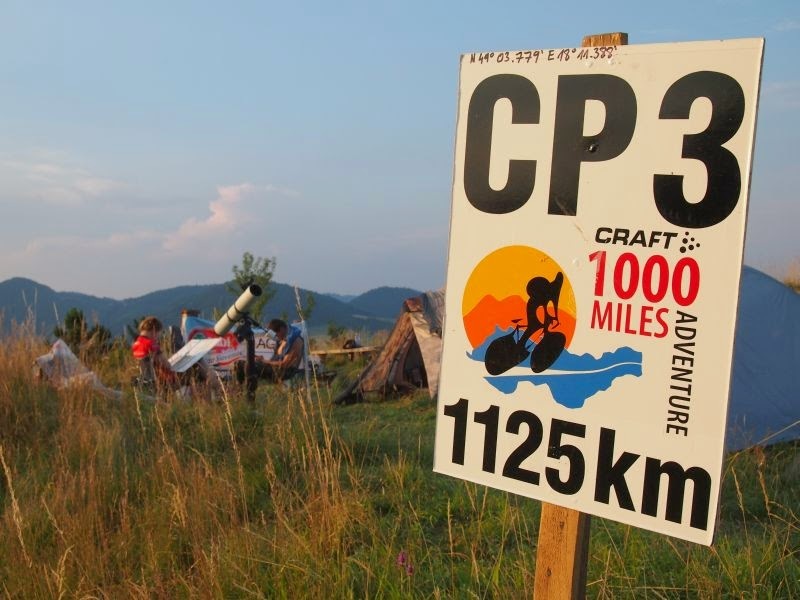 CP 2 is about halfway through the route and it is also the finish line for the 500 mile race. It was a magical place where many were antsy, trying to figure out for themselves whether or not to end the suffering, or to continue and prove themselves that they could do it. I didn’t have to answer this question for myself, as I was absolutely sure that I wanted to continue, because the route was so awesome that my body and mind were totally yearning to see all places and spots ahead, across even wilder Slovakian mountains. Although the route is strictly given and you somewhat intuitively follow the GPS device, following a logical route, there were times when I wasn’t quite sure, but sure enough the harder option always proved to be the correct one. Every day I sent a SMS message to the organizers, in which I was expected to describe how I feel and mainly to announce my GPS position at which I was currently located. In one of my last SMS messages from an awesome and totally remote place near a huge Slovakia water dam I proposed to my girlfriend using this SMS. These, as well as other moments are completely unique; you probably cannot experience anything similar in any other race. During the race I experienced all types of different moods, from total euphoria to total helplessness. I had to cope with more or less pain, still knowing what my motivation and drive were. I fought with the loss of sensitivity in my big toes and had to endure back pain, but I managed to overcome all of that and to move from my personal comfort zone to a different dimension. It is not just a 24h race on some 10 miles loop where you can take a rest in the pit. This was and is a race where you have to grind your teeth every morning, work flat out until dusk or even through the entire night, and keep moving whatever the weather is. Demanding climbs lasting several hours, followed by awesome wild descents, that is an experience that cannot be properly described in words; you have to experience it on your own. The other racers are your opponents on the start line, but by the time you make it to the finish line, they’ve become your best friends. These are some of the essentials experiences I had during this race and I will forever cherish them until the end of my days as some of the best I have ever had. Perhaps no later than now, I am considering a return to the starting line to experience this unique adventure again; an adventure 2nd to none in Europe. Pekny report.. hezky zavod... Porad si rikam, ze by bylo super to obehnout/ujit.. Vim, ze to par lidi uz udelalo.. Pred kazdym smekam, at uz na kole nebo pesky.. Myslim, ze clovek ma spoustu casu si vsechno promyslet.. Proto je hezke, ze to skoncilo, tak jak pises..